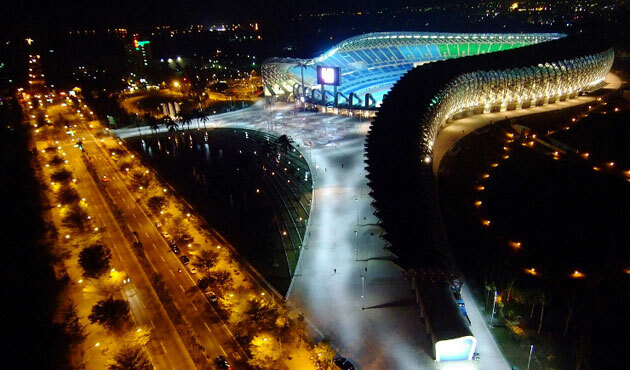 A beautiful integration of renewable energy and modern green design, the recently finished solar stadium in Taiwan will welcome the 2009 World Games to 3,300 lights and two jumbo screens all on 100% solar energy. 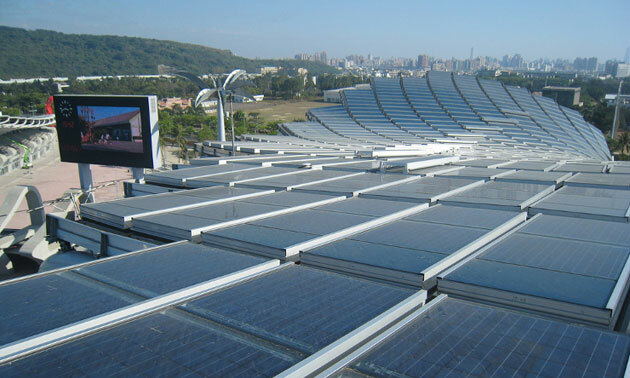 Designed by Toyo Ito, the 14,155 sq meter roof consists of 8,844 solar panels generating 1.14m KWh (that is 1.14 gigawatt hours of electricity) a year. When not powering the stadium lights, the power will be funneled into the local power grid and is expected to meet almost 80% of the neighboring area’s energy requirements. It is estimated that this stadium will prevent 660 tons of carbon dioxide (CO2) a year from being released into the atmosphere when compared to a traditional powered stadium of this size. However, they didn’t just stop there- the stadium site boasts many other green features including permeable paving, green spaces, and the extensive use of reusable, domestically made materials. They even went so far as to transplant all of the pre-construction vegetation. 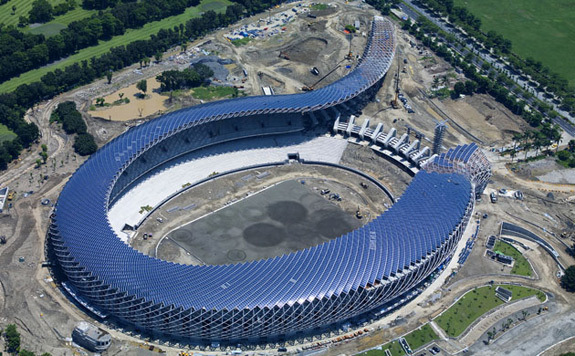 It appears that some of the stadiums solar efficiency may have been impacted by the design (not exactly optimal for maximum sun exposure), however, the almost circular nature of the construction allows for energy production throughout the suns path through the sky. In any regard, its great to see such a wonderful modern design put to work by renewable solar energy. 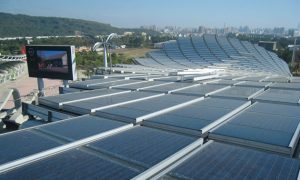 I am thrilled to see the solar stadium.I believe more and more people will be attracted to the world game 2009. If properly installed, renewable energy systems could help reduce the effects of Climate Change and Global Warming. I know of another company that was among the first to provide engineered solar thermal and solar electric solutions to customers in Eastern Ontario.